Hotspot 2.0 and the Next Generation Hotspot initiatives are possibly the most exciting areas of wireless progress occurring in 2012. For starters, these developments have a worldwide scope of influence. The technologies that come to market as a result of these programs will directly affect a large portion of the world’s population. If brought to market with extensibility, they could revolutionize the hotspot ease-of-use and security landscapes. These programs deserve the spotlight. The Initiatives Hotspot 2.0 and Next Generation Hotspot (NGH) are highly complementary initiatives, but they are different in scope. Hotspot 2.0 is the Wi-Fi Alliance’s certification program that will include a technical specification defining the Hotspot 2.0 technology. Following the Wi-Fi Alliance’s core purpose, Hotspot 2.0 will also be a device certification, based on product interoperability testing, that allows vendors to implement the protocols in a common way. Hotspot 2.0 is designed for Wi-Fi clients and infrastructure devices to support seamless connectivity to Wi-Fi networks. The specification is still a document in progress, but as a non-Wi-Fi Alliance member, I have a little bit of insight about what we can expect. The first thing to understand about the specification is that the Wi-Fi Alliance is not attempting to define all new technologies. The Hotspot 2.0 effort is a bit more like putting together the pieces of a fragmented puzzle. For example, the spec will draw largely (and selectively) from 802.11u, which enhances network discovery and selection by Wi-Fi clients. 802.11u provides all the protocol-level “hooks” for infrastructure vendors (the WLAN controller and APs) to interwork with backend services (like hub AAA proxy servers and operator AAA servers and user databases). Perhaps more important than the backend integration and querying, 802.11u also provides the protocols and frame components that allow the clients to learn about the backend services on the network. The client can learn what service providers or roaming partner agreements are available through the BSS, what the hotspot service model is like, and the client can even query the backend services for other information. This level of backend transparency facilitates the seamless client selection and connectivity process. In addition to 802.11u, Hotspot 2.0 will draw on the familiar 802.1X/EAP architecture we use in Wi-Fi today. Four EAP types are in the existing spec: EAP-SIM, -AKA, -TLS, and -TTLS. Obviously, the cellular convergence focus comes in with EAP-SIM and AKA. 802.1X is also incorporated for user authentication, but the backend components will vary from one network to another. In most cases, the WLAN infrastructure (APs and/or WLC) will integrate with a “hub” AAA proxy server that interfaces directly with each operator’s AAA server. Or the WLAN may interface directly with AAA servers belonging to the network operator as well as a AAA proxy for other operators in a roaming agreement. 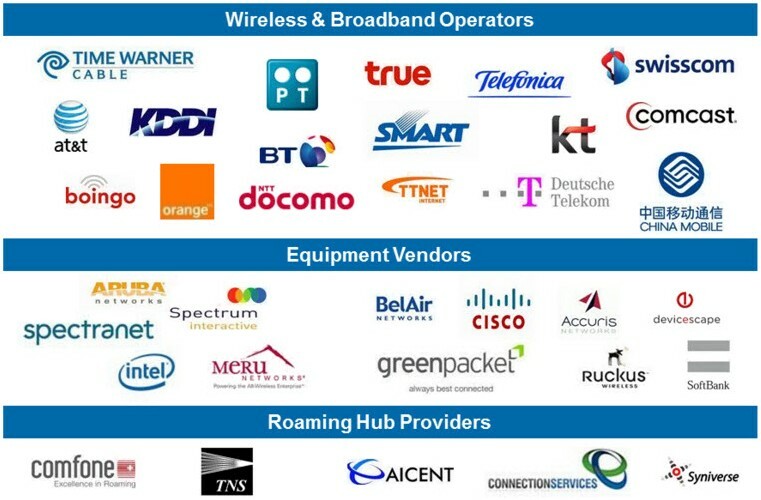 This is where the business complexity gets interesting, and also where the Wireless Broadband Alliance’s (WBA) work with Next Generation Hotspot (NGH) picks up. The Wi-Fi Alliance’s Hotspot 2.0 is primarily focused on Wi-Fi device interoperability and testing (i.e. clients and APs), but the WBA’s mission is targeted at the whole scope of functionality and interoperability, including interoperability between network operators and service providers on the backend. In 2011, the WBA conducted NGH trials, which are real-world functionality tests using equipment from the participating vendors. Wi-Fi client and infrastructure participants were required to first pass the Wi-Fi Alliance’s Hotspot 2.0 test events. In the NGH trials, the approved Hotspot 2.0 devices were tested with the various backend systems and architectures. NGH trials included testing for different authentication setups, including direct authentication with the owner operator (e.g. AT&T SIM on an AT&T network), authentication through third-party hubs (e.g. using Syniverse or others as a AAA proxy to an operator’s servers), and through visited network operators (e.g. AT&T SIM on an Orange network). Based on the results of the NGH trials, the WBA is creating recommendations to bring these operator and service provider technologies to market in a consistent and interoperable way. Here’s a sample (not comprehensive) of participating companies. NOTE: Not listed in the graphic is a key player in the Hotspot 2.0 (Passpoint) picture, HP. HP is involved in both the Wi-Fi Alliance and the WBA and provides equipment and software for Hotspot 2.0 solutions. The WBA predicts a published Hotspot 2.0 specification by (or before) Q3 2012, at which time the Wi-Fi Alliance will begin certifying products. The Hotspot 2.0 and NGH initiatives are battling against steep odds to unify the industry for a common goal. Hotspot connectivity today has a number of problems—no security, manual network selection, poor user experience—and every industry initiative in the past has failed to produce any significant real-world changes. Though still in the developmental phases, Hotspot 2.0 and NGH offer a lot of promise for solving some everyday user challenges, and providing business opportunities at the same time. The Wi-Fi Alliance and Wireless Broadband Alliance have their hands full, but this is a development worth watching. Unfortunately, the Hotspot 2.0 program is still largely focused around telecom carriers and mobile network operators instead of public hotspot operators, which is where we need change. Hotspot 2.0 should pave the way for this change over time, but it is less of a focus in the short-term future.